Polka Dot Overload | Sewing, knitting & vintage projects, tips, tutorials and cartoons! 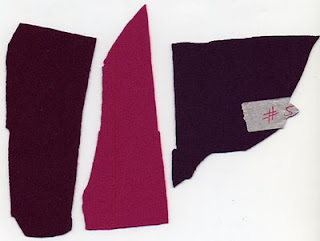 : Mini-Wardrobe Progress--Double Knit Color Options! Mini-Wardrobe Progress--Double Knit Color Options! I mentioned before that after initially purchasing gray double knit for my mini-wardrobe cardigan jacket, I began to have some serious doubts--gray, after all, just Isn't Very Mikhaela. 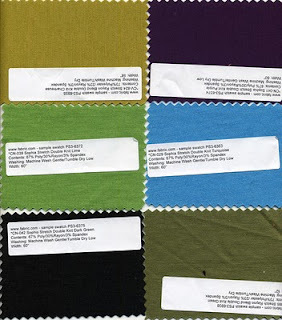 But I wasn't sure about the color Fabric.com was calling "Chartreuse," so I ordered a variety of their double knit swatches and picked up a few from the Paron's 50% Off Annex as well. The Fabric.com swatches finally arrived today (much slower than their actual yardage fabric orders). I'm happy to report that the chartreuse is indeed chartreuse and not mustard, though it's somewhat on the subdued side. I dropped the best colors into my digital sketches and here's what I came up with. Purple. Too monochromatic, I think--I look like a pregnant grape. Lime. This one intrigues me--green and purple are such a great combo. But THIS green? Fuschia--like chartreuse, I firmly believe fuschia goes with almost ANYTHING. I don't have much time to mull it over, as a few of these colors are running low in stock (not the chartreuse, though). I'll give it a day and make an executive decision. Your thoughts? And remember--I like bright colors! By the way, Masheka strongly prefers lime or purple--he doesn't think this shade of chartreuse is eye-popping enough for me. He might be right. As for progress on the patterns themselves, my hopes for getting a few of them muslined this Monday (I had a day off) were dashed when I ran into the hard cold realities of maternity alteration sewing. I can't just start cutting patterns willy-nilly if I want to be able to use them later, so I spent Monday tracing the patterns and ironing like, 6 yards of muslin (why I washed it is beyond me--it's not like I'm going to wash the muslins, so all the tiny little wrinkles I had to get out were just pointless pain). I'm still working on my FBAs and belly adjustments before even getting to the muslin stage. 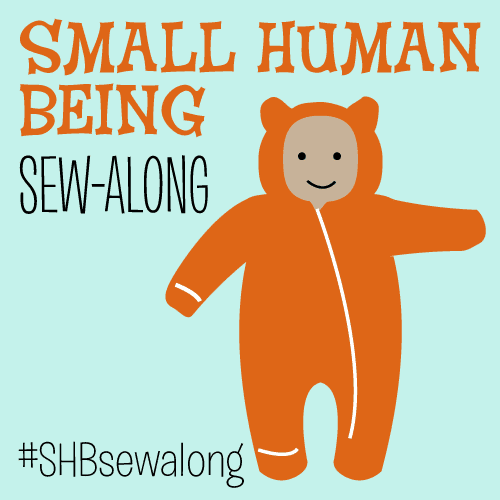 I have only three sewing weekends left for this contest so I had better get cracking! I'll be doing a detailed post on this (tentatively titled "Sewing at a Moving Target: Maternity Modification Strategies") sometime soonish. Ooo... I like the lime and fuschia the best! Good luck with the tracing and altering! I love the boldness of our outfits! The turquoise, it really pops and second best, the lime, then the fuschia. Lime. My mum told me when I was little that green and purple were feminist colours. I have never seen any evidence of this in real life but it has stuck with me. I'm usually partial to magenta (totally goes with anything, you're right), but pink and purple always feels a little too girly (at least having several several outfits). I love the chartreuse and the lime! 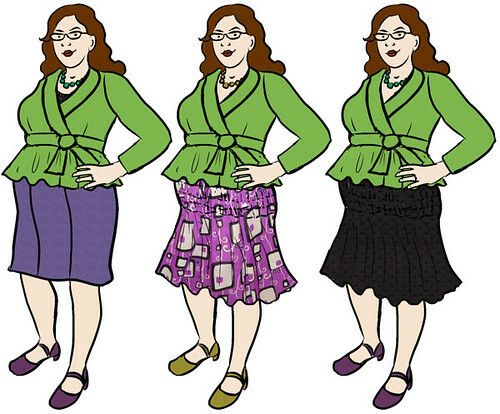 My favs in this order: fuschia, turquoise, then purple (b/c I love purple!). But really that's just by looking at them in the drawings; the swatches of actual fabrics held together in your hand might look completly different. Good luck on the muslins! I'm partial to the pink. Well, after thinking all day... I think I'll go lime (fuschia was a close second). Masheka says this particular chartreuse looks like boogers, and I don't need a Garbage Pail Kids jacket for my spring wardrobe!